Haverland Designer TT electric radiators use the latest thermal fluid technology, providing energy-efficient heating for a range of spaces. Featuring open window detection, adaptive start, and an in-built energy monitor, the Designer TT range is an eco-conscious heating system for modern households. Download the Designer TT Manual and Programming Guide here. The TT was updated in 2018 to conform to new EU energy efficiency regulations. If you have an older version of the TT, purchased before 2018, you can download the original Manual and Programming Guide here. Haverland TT Electric Radiators are easy to install with very basic DIY knowledge . They simply screw to the wall and plug into a normal 13amp socket. Each radiator is supplied with wall plugs, screws, and a template to show you where to put the screws. All you need to do is drill four holes, mount the radiator on the bracket supplied, and plug into the nearest socket. It really is that simple. Haverland Designer TT Electric Radiators come with a 3 Year Manufacturer’s Warranty on the electrical components and a 10 Year Warranty on the radiator body. Designer TT electric radiators are available with free next working day delivery. You can choose your delivery date from our calendar at the checkout. Next working day delivery dates are available when you order before 12pm (excluding weekends). 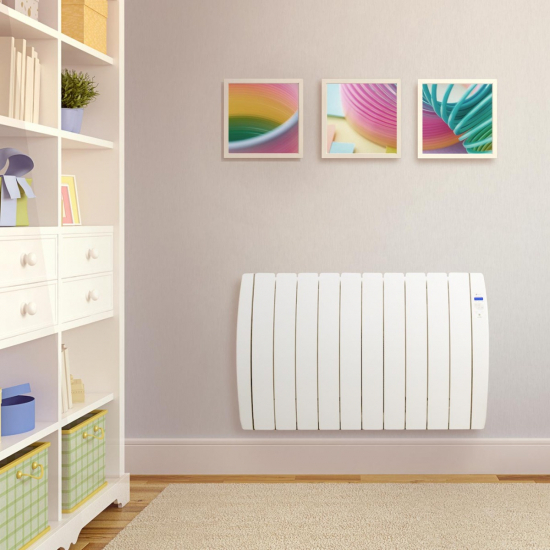 Designer TT electric radiators are easy-install, fully programmable electric heaters with state of the art energy management features designed to keep your heating bills as low as possible. The Designer TT range optimises energy efficiency with the latest thermal fluid technology, a high precision electronic thermostat, a built in energy monitor, and fully programmable heating control. The excellent heat retention properties of thermodynamic gel prevent the radiator working hard to maintain temperatures, saving energy and reducing your heating bills. The precision thermostat is accurate to 0.2 °C, so the radiator will switch on or off automatically to maintain a comfortable temperature. With good insulation, this means the radiators only use power for a fraction of the time – creating massive energy saving potential. Fully programmable controls allow you to set a 7-day heating schedule to suit your lifestyle, with different settings for every hour of every day of the week. TT electric radiators are easy to control from the lockable, appliance-mounted control panel. You can take your pick from 4 pre-set heating programmes and 1 customisable heating programme, and you can even control different rooms or areas of your house separately – keeping busy areas comfortable and preventing heat wastage in empty rooms. The in-built energy monitor allows you to review and fine-tune your heating programmes, helping you minimise wasted energy and keep your heating bills as low as possible. This new Designer TT range, updated for 2018, also features adaptive start and open window detection functions to improve efficiency and lower running costs. If a window is opened, these electric radiators will sense the sudden drop in temperature and temporarily switch off until temperatures stabilise. This ensures you don’t waste energy if a window is left open accidentally. Meanwhile, the adaptive start function kicks in whenever the TTs’ temperature is scheduled to change. Rather than starting or stopping the heat at the scheduled time, the TT range prepares in advance, learning how long it takes to raise the temperature and tapering its heating so it hits the desired temperature on time. Designer TTs are also mess-free, safe, and easy to use. The heating element is even fully enclosed so there's no danger of wall blackening. The control panel can be set to your choice of three languages (English, French and Spanish). Additionally, the radiators’ built-in memory can store your programming for up to 24 hours without a power connection – so you won’t need to worry about re-programming your radiators if there’s a power cut. The elegant contemporary design of these radiators make them discreet yet stylish additions to any home. They're eco-friendly too: the 100% recyclable radiator body is made from high-grade recycled aluminium. Installation is simple and fast, a straightforward DIY task. Simply screw to the wall and plug in at the nearest socket. Full installation and programming instructions are included. See installation for more details.